What do you do when you realize you only have 5 months before a baby arrives and changes life forever? You book a vacation…fast! 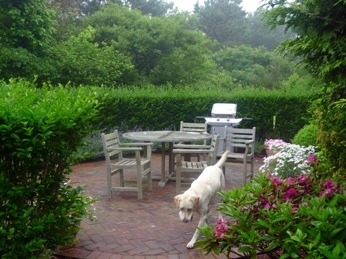 Our Nantucket vacation started early Saturday on a typical foggy New England coastal morning. We boarded the 7:15 ferry from Hyannis for the 2 hour trip to Nantucket. We had our puppy on board so we sat outside on the bow for the entire trip and the fog burned off and finally we saw Nantucket in the distance. There is something special about arriving by ferry - you feel like you’ve gone back in time and are a world away after just a short trip, and it’s a no-hassle way to travel so you really arrive feeling relaxed. We brought our car to the island which allowed us to stuff it full of bikes and food and other goodies for the week. We drove into town and saw a farmers market happening, so we walked around and left with a beautiful bouquet of flowers for our house. We hadn’t eaten yet so we went to Something Natural which is a great sandwich place off of Cliff Rd. It’s just out of town and you order inside then bring your sandwich out to one of the picnic tables on the lawn. 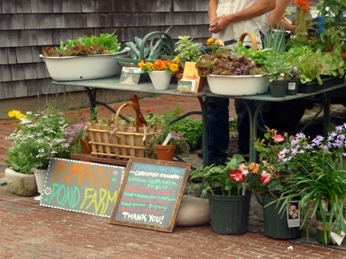 Dogs are welcome and it’s a favorite stop for bikers on their way to the beach. Afterwards we ventured out to our house in Surfside, NAN SS5. The house is only a few miles from town and close to a couple bike trails and the beach. Tucked down a dirt road in a quiet neighborhood, this location is very peaceful. There are lots of trees and flowers around so you feel very private in the yard. There is an outdoor patio as well as a deck at the front door, so lots of room to listen to the birds and watch the rabbits. There is a well equipped kitchen and a gas grill outside and dining tables inside, outside on the patio and on the screened porch. The first floor is all common spaces with bedrooms on a lower floor and on the second floor. I recommend the master bedroom upstairs for a perfect nights sleep where you can fall asleep to the sound of the surf and wake to the chirping birds and the horses arising next door. The outdoor shower is a great treat for enjoying a morning shower in the sunshine. I’m happy we visited Nantucket in June. It’s still pretty quiet there as far as crowds, but all the restaurants and shops are open. The weather was great and we took advantage of the beautiful beaches. Closest to the house is Surfside/Miacomet. You can take a 15 minute bike ride there or drive and park or drive right onto the beach with an oversand permit that can be purchased at the police station for $100. 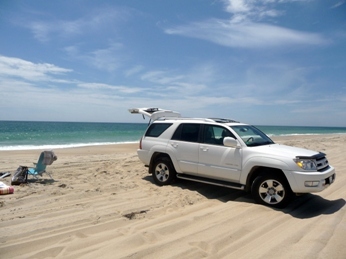 We decided to get the permit and enjoyed the fun of driving on the beach and being able to access different areas that we might not have walked to. 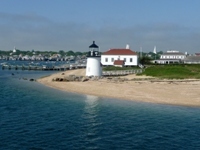 We enjoyed the beach at Madaket where we saw a seal lounging on the sand and where you can explore the calm harbor. At ‘Sconset beach we saw at least 4 seals who kept swimming in front of us and popping their heads up to watch us, it was an incredible treat! We also visited Dionis beach which was a calm beauty with lots of shells. Since it was early in the season, the beaches were relatively empty and we were able to bring the dog out for swimming and running.